A Record of Us is a physical exploration of what it means to be a New Brunswicker that fuses text and movement together in a series of living snap-shots. Using the text of celebrated New Brunswick author David Adams Richards as the catalyst, the company has built a performance that evokes the raw beauty, the enduring humour and the hardscrabble realities of this province. The creation of A Record of Us began in the spring of 2015 when Lesandra Dodson and Lisa Anne Ross first launched the coop, which is a performance collective for professional artists to research, develop and perform original works of physical theatre while supporting the artistic growth of emerging NB artists through training and performance opportunities. Solo Chicken Productions and The NotaBle Acts Theatre Company co-presented the coop’s inaugural work, A Record of Us, as the featured mainstage production at the 2016 NotaBle Acts Summer Theatre Festival. Performances took place at The Fredericton Playhouse, July 20-23 2016. This co-production marked an exciting opportunity for both companies, whose mandates share the common goal of supporting the work of New Brunswick artists. A Record of Us was directed by Dodson, Ross and performed by the coop company members Jean-Michel Cliche, Alexander Donovan, Ian Goff, Alexa Higgins, Lexi MaRae and newcomer Kira Chisholm, with lighting design by Jeff Fevens, and stage management from Brittany Long. 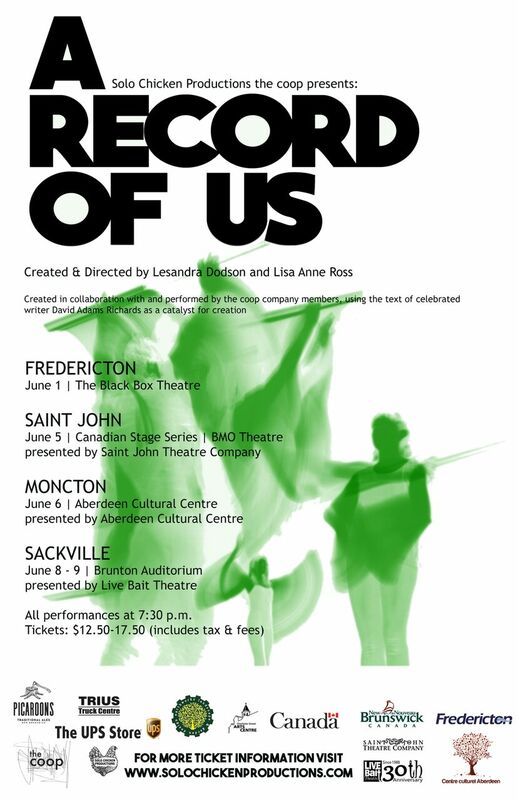 In June of 2018, the Coop took A Record of Us on tour, with performances at the BlackBox theatre in Fredericton on June 1st, at the BMO theatre on June 5th as part of Saint John Theatre Company's Canadian Stage Series, on June 6th in Moncton's Aberdeen Cultural Centre, and on June 8th and 9th at Sackville's Brunton Auditorium as part of LiveBait Theatre's Women's Festival.The original company returned for the tour, with the addition of Stage Manager Dee Chiasson, and Lighting Designer & Technical Director Trent Logan.